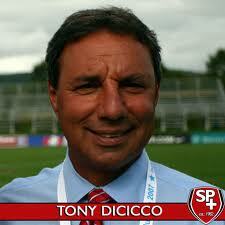 Announcements Coach Tony DiCicco given US Soccer's highest honor! CHICAGO (Dec. 21, 2017) – Former U.S. Women’s National Team head coach Tony DiCicco, who passed away last June, has been posthumously named the winner of U.S. Soccer’s prestigious Werner Fricker Builder Award. As U.S. Soccer’s highest honor, the Werner Fricker Builder Award is given to an individual or group of individuals who dedicate at least 20 years of service to the sport, working to establish a lasting legacy in the history and structure of soccer in the United States. The award recognizes those who have developed programs that will outlast their own involvement in the sport. The award was first presented in 2002. “2017 has been an emotional year for the DiCicco family,” said DiCicco’s son, Anthony. “Rather than mourning the loss of Tony, we have sought all year to celebrate his contributions on and off the field. 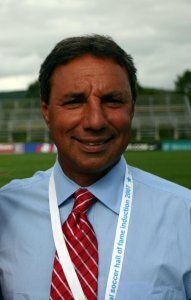 DiCicco’s association with U.S. Soccer began in the late 1980s and in 1994, he took over from Anson Dorrance, himself a Werner Fricker Award Winner in 2016, as head coach of the U.S. Women’s National Team. DiCicco then led the USA to a third-place finish at the 1995 FIFA Women’s World Cup in Sweden. “The Family is proud and humbled that the Werner Fricker Sr. Memorial Award Task Force saw fit to bestow him with this most prestigious honor,” Anthony said. “But for many who befriended him through the game, he is remembered for his personal investment and mentorship of countless individuals all of whom play and have played a role in the upward trajectory of soccer in the United States. We share this award with all who knew and loved him. DiCicco is the third consecutive winner to come from the women’s game, following Dorrance (2016) and 1991 FIFA Women’s World Cup champion goalkeeper Mary Harvey (2017). The award is named for Werner Fricker who served as U.S. Soccer President from 1984 to 1990 and was inducted into the National Soccer Hall of Fame in 1992. Fricker is widely credited for playing a major role in bringing the 1994 FIFA World Cup to the United States. Born in Yugoslavia and raised in Austria, Fricker lived his adult life in Pennsylvania, where he was a star midfielder for the United German Hungarians of Philadelphia soccer club from 1954 to 1969 and was a member of the 1964 U.S. Olympic Team. The U.S. Soccer president appoints a task force to review nominations. The nomination and consideration process takes place annually with a maximum of one award given each year; however, the Selection Committee is not required to bestow the award annually.